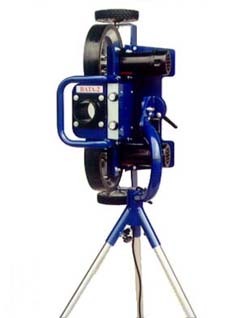 The versatile BATA-2 Baseball Pitching Machine (above) and theBATA-2 Softball Pitching Machines (right) are the choice of more professional teams every year. Capable of throwing any type of pitch, it's maximum speed exceeds 100 miles per hour.Also ideal for throwing grounders and fly balls. BATA-2 is the only machine with Soft-Tread Pitching Wheels, designed specifically for throwing real leather baseballs.